When Michael Schaffer and his wife drove to a rural animal shelter and adopted Murphy, a mistreated Saint Bernard, they vowed that they'd never become the kind of people who, say, get their dog a facial treatment. But then they started to get weird looks from the in-laws: You hired a trainer? Murphy is on antidepressants? It turned out Murphy wasn't alone: yesteryear's pooch has moved from the backyard doghouse to the master bedroom, evolving from man's best friend to bona fide family member. One Nation Under Dog is the beloved chronicle of this new world of American pet mania. 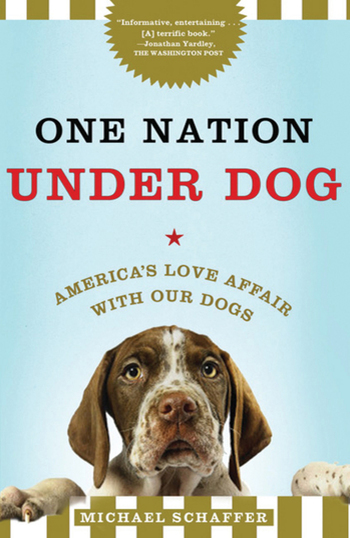 Schaffer, guided on occasion by Murphy, provides a surprising, lively, and often hilarious portrait of our country—how the way we treat our pets reflects evolving ideas about everything from science and consumerism, to politics and family—through this fabulously reported and sympathetic look at both us and our animals. Michael Schaffer is a former staff writer at The Philadelphia Inquirer, US News & World Report, and Washington City Paper, and has written for The Washington Post, Slate, The Daily Beast, and The New Republic, among other publications. He lives in Philadelphia with his wife, Keltie Hawkins, and their daughter, Eleanor. They insist that their own pets, Murphy the Saint Bernard and Amelia the black cat, are not freakishly pampered.